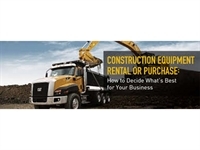 WELL KNOWN SALES AND RENTAL OF CONSTRUCTION EQUIPMENT. This amazing opportunity to purchase a company that is in a league of their own in this industry. No other competitor matches to this companies niche market and offerings. Full Sales Business for the building/construction industry as well as a home owner with the need for improvements. Full Rental Supplies business as well, try before you buy. Quality products are unmatched here with the available brands this company carries. Large impressive showroom for sales. Warehouse building that resides on 58,000 square feet of property. Located on a major thoroughfare for maximized exposure. This business sits on 6.5 acres of property.